Sometimes you never quite know what you’re going to get in love and sometimes that statement doesn’t always apply to the other person for you can be equally as ambivalent towards them as they are towards you. Enter Venus into Gemini today. A placement of Venus that tends to bring out the flirtatious, curious, communicative butterfly which flits, flies and flirts from person to person or situation to situation never quite totally settling upon a set form…. unless caught. Do not get me wrong the Lovers card is a great card to have and if Venus had been entering a sign, such as, Scorpio, Cancer or Leo (to name a few) today then my interpretation would’ve been different. 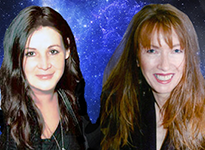 But if you like your love in the shape of communicative, curious, never quite pinned down style of that of Venus in Gemini then is what’s being served up for the next few weeks… get ready to flirt! 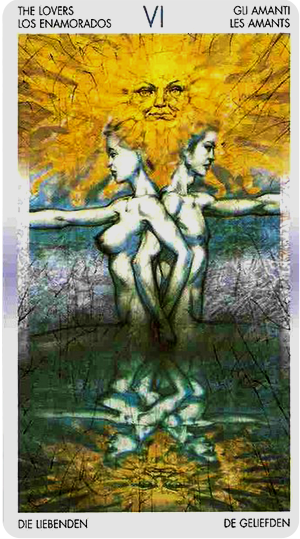 In today’s tarot card you see a man and a woman with their backs to each other yet they hold a unified stance against their environment as their arms are linked together and they hold the exact same amount of “space” within the card… neither of them are overbearing or taking up more space than the other. There is no tension here yet there is the unmistakable feeling that something isn’t quite right or that there are things going on around them that they need to watch each other’s back and therefore present a unified front against the world. Are they in love or in love with the idea of being in love? As I gazed into the reflections in this card I was struck with the sense of even though there is strength and a unified presence perhaps all is not as it seems to be. Look into the waters where their reflections lay and also that of the sun which usually shines with such a bright light it brings a smile to your face. Not this sun though… this sun is sitting on the side lines… neither smiling nor frowning and therein perhaps giving the best glimpse of what this card and day is truly about. Venus entering Gemini…. sometimes you never know where you stand… happy, sad, up or down. I hope someone has your back. This card is part of the the Tarot of Reflections by Francesco Ciampi published by Lo Scarabeo and distributed by Llewellyn.